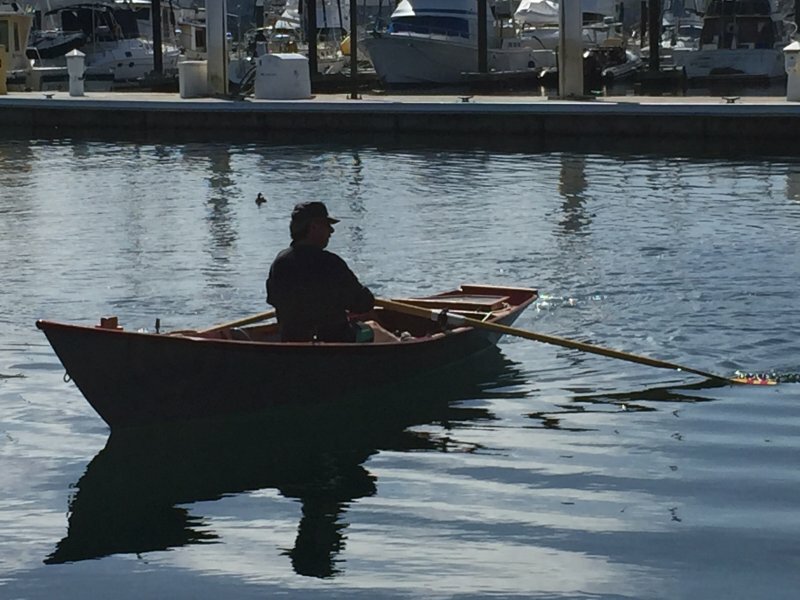 WU WEI is a Gloucester Light Dory recently relaunched and “reimagined” by Jim Thompson who rows her and fishes from her on Monterey Bay in California. In 1992, Thompson’s friend Swarup Wood followed plans by Dynamite Payson and Phil Bolger to build the 15′6″ dory and named her VINAYA. She was built from Douglas-fir plywood covered with fiberglass set in epoxy. Swarup and his family took VINAYA on fishing and camping trips to Baja, California, until his family outgrew her. Then she languished outside for over a decade until Jim rescued her in 2015. 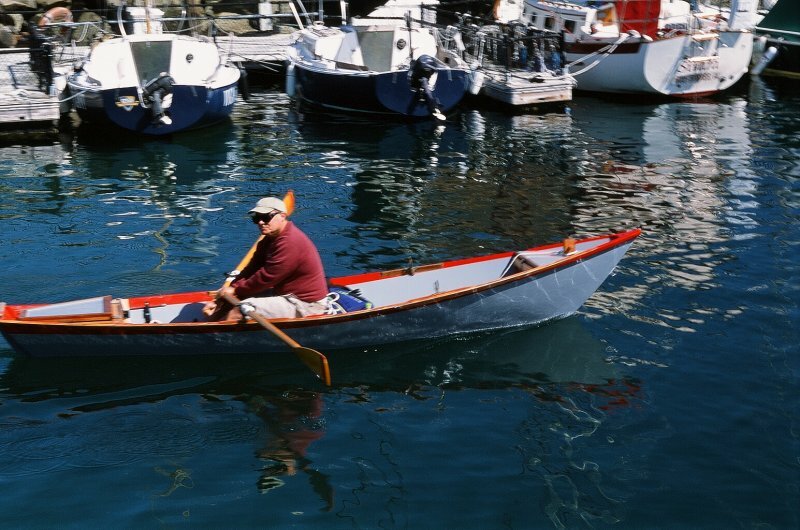 The first thing Jim did was scrape off the lichens and delaminated fiberglass, then he started reimagining the dory. The transom was all rotten, so he cut that off at a shallower angle, and shortened the overall length to 14′. Below the waterline, he built up the skeg and lapped it to a sternpost. Then he resheathed the exterior in 6-oz fiberglass cloth set in epoxy. Next he stiffened the hull with new frames in the bow and stern. After that he added flotation and sealed the lockers under the seats to make them watertight, resulting in a total 300 lbs of reserve buoyancy. 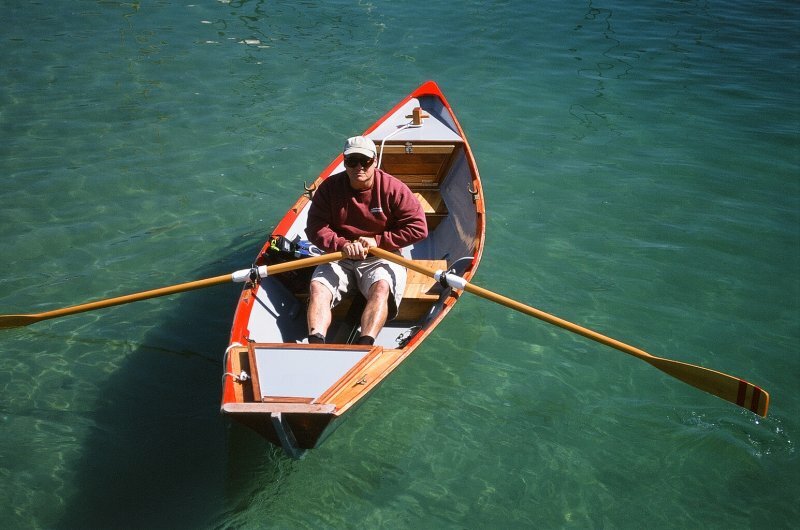 He made rowing WU WEI much more efficient by adding a Piantedosi drop-in sliding seat and Concept 2 oarlocks. Jim free dives and notes that the flat transom and stern hatch cover allow easier ingress and egress. 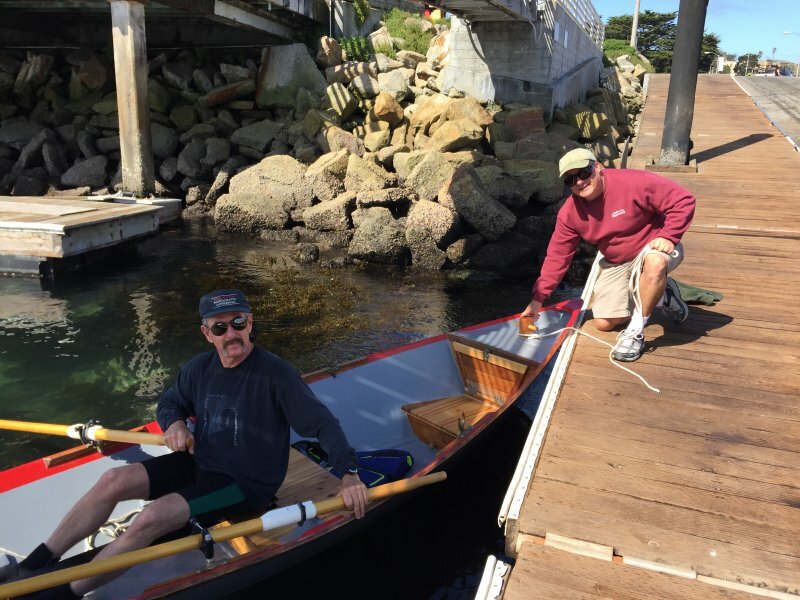 Jim spent a year of his spare time restoring this dory, heeding the Taoist maxim, “Wu wei.” (Don’t push or force things. Let them follow their nature.) He relaunched WU WEI in March 2016. Payson’s and Bolger’s books are available from The WoodenBoat Store, www.woodenboatstore.com. Looking at the attached images. Jim Thompson took the first two photographs, both of Swarup Wood at the oars on March 31, 2016, launch day. Chris Wood took the last two photographs, the first with Jim at the oars on the same day, the last image shows Swarup rowing with Jim as passenger.